American boxing fans in particular must be bemoaning the news that unbeaten WBC heavyweight champion Deontay Wilder will be facing French WBC #12 ranked Johann Duhaupas (32-2, 20ko) on September 26th in his home state of Alabama in a scheduled PBC on NBC broadcast. It is a frankly disappointing defence against more low-level opposition from the Al Haymon “advised” fighter – of whom fans are demanding much more – and at the first official presser to announce the fight on Thursday, it was evident the delicate process of polishing a turd had already begun. “It (fight)excites me because I love making history,” Wilder said without a hint of irony, and an enthusiasm most fans are finding hard to muster. It’s clear that serious boxing fans are being taken for a ride by Haymon and Wilder and that the game is to try and build a solid fan base of casual sports fans in Alabama to attend fights against opponents that serious fans of the sport are finding insulting. “Fighting at home last time exceeded my expectations and coming back again is a blessing upon my life. The limited Duhaupas was beaten by new EBU champion Erkan Teper in March, but bounced back in April with a 10 round decision win over heavyweight contender Manuel Charr. This, along with the fact he has yet to be stopped, appears to be the selling point for September’s defence. “When you get an opponent that’s never been knocked out and been in the game for a while, that’s exciting. That’s my goal, to knock him out, to be the first. “When it says he lost and you look on there and see he got knocked out, my name will be on there forever. 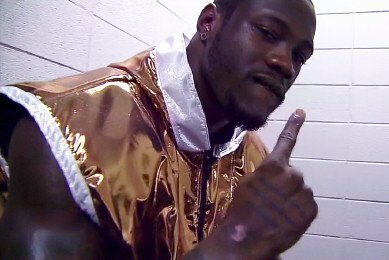 “I like everything about him,” Wilder said of his opponent, which translated means Duhaupas was carefully selected by Deontay’s handlers in a flagrant “cherry pick”. “I like the size. I like the height. I like the way he throws combinations. I think he’s a perfect opponent for this arena to do what we’re trying to do. Wilder’s mandatory defence against Alexander Povetkin is due in January. Povetkin fights Mariusz Wach in November, in Russia.